Biulir Dal is known as Urad dal in the rest of the country. But in Bengal, this dal is known as Urad dal or Kalai dal. We used to cook the halved Kalai er dal. You may roast the dal or may not. 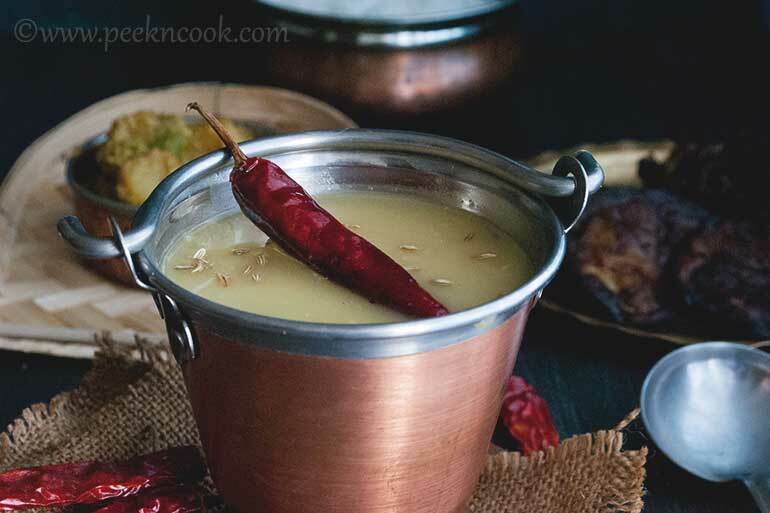 Take the soaked dal in a pressure cooker, add sufficient water to it and boil till 4 to 5 whistles. It depends on the place where do you live. If in hill station the water will be hard, and you need more whistles to cook the dal properly. So if the dal is not done, just add little more water and boil for another 2 to 3 whistles. Now take a wok, heat oil & ghee, temper the oil with red chili, bay leaf, fennel seeds, and hing and fry everything for few seconds. Now pour the boiled dal into the wok, add 1/2 cup water salt and sugar and boil for 10 minutes, covered on low heat. After 10 minutes, open the lid, check for salt and sugar, add if needed. Now add the ginger & fennel seeds paste and give the dal a nice stir. Turn off the heat & serve hot with steamed rice & 'Aloo Jhinge Posto'. Take the poppy seeds in a blender, add little water and 1 chili, and blend to make a smooth paste. Add little water as per need. Now take the potato, peeled them, and cut into chunks. Take the jhinge, peeled and cut them too into chunks. Take everything in a strainer and wash under running water. Take an iron kadai, add mustard oil and heat until the oil is smokey. Temper the oil with green chili. Add the potato and ridge gourd chunk, a little salt and fry for 3 to 5 minutes. Now add turmeric and poppy seeds paste and mix everything well to coat the vegetables with the poppy seeds paste. Add little water and cover the pan, lower the gas to cook the vegetables nicely. It will take at least 5 minutes. Again cooking time depends on the place where do you live. In Kolkata, you don't need more than 5 minutes if you're cooking with 'Chandramukhi Aloo'. But in Hyderabad takes longer than 5 minutes. So just check after few times. If the vegetables are cooked then go for the next step or stay there for another few minutes. If the vegetables are cooked, higher the gas, and dry the excess water to make dry aloo jhinge posto. Check for the salt, add if needed.